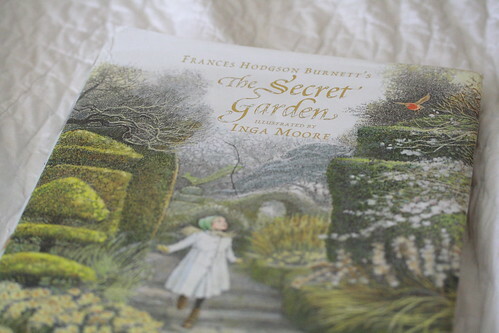 The Secret Garden by Frances Hodgson Burnett, and illustrated by Inga Moore. Elisabeth and I read it last spring. 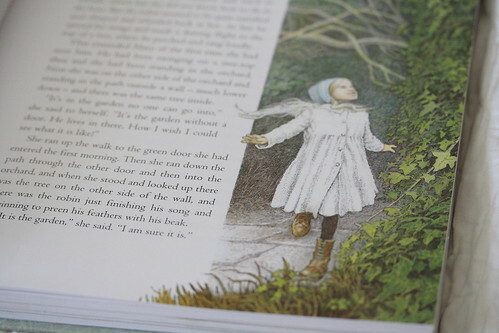 Now, The Secret Garden is neither my favorite piece of children's literature, nor my favorite read-aloud book of all time. (I mean, the phonetic spelling of the Yorkshire dialect? Wow. What a way to turn an excellent aloud reader into a stuttering mess.) Also, the story has some pretty dark elements (I had to omit a few passages as I read it). 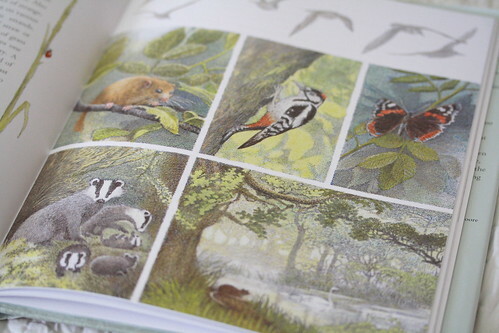 But -- and this is a big "but" -- the illustrations by Inga Moore are absolutely breathtaking. And they are all throughout the book. Not only are there several lush full-color, full-page spreads in every chapter, but there are smaller illustrations on almost every page. Some are in color, and some in black and white. Some illustrate plot developments, some illustrate anecdotes or funny sayings from the text, and some are botanical illustrations showing how the garden and the world came alive for Mary Lennox (and all of Misselthwaite Manor) that spring and summer. 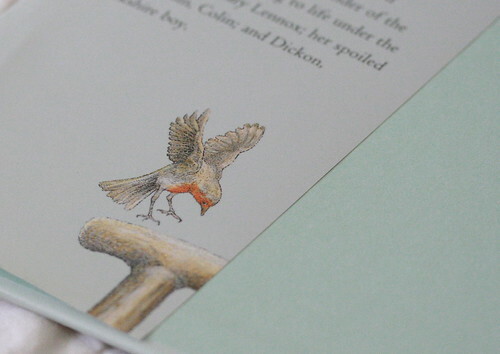 The details of this book are so beautiful. Anyway, I hope you all have the opportunity to experience this beautiful book first hand. I don't know why this should come as a big surprise to me, but since I've been blogging every day in November, I've noticed my online time has increased more than I would like. I think what I'm going to do to keep it more manageable for myself is to post in the evening after my kids are in bed rather than during the day as I have been trying to do. Each post will still be "new" for the same amount of time, but the time of day that they'll go up will change. So, keep on visiting! I'll still be here every day for the rest of the month. Hopefully this will keep things predictable for you and for me.